Golden State gets Kevin Love, Kevin Martin? Minnesota gets David Lee, Klay Thompson? Kevin Love is not even a free agent, but continues to be talked about this offseason. There was a time where this trade was almost certain to happen before the NBA Draft and now may not happen at all. Golden State seems to be a disagreement about whether or not to give up sharp shooter Klay Thompson and whether or not to take back Kevin Martin’s big contract. Could Thompson really be the reason why Love does not end up in Golden State? I do not think so. I think ultimately this trade will get done and Love will be playing next to Stephen Curry and Andre Iguodala before the start of next season. The timing of when this trade gets done is crucial for the rest of the league. The Warriors could be real contenders by just adding Love, but could be even bigger players to get another big time free agent this offseason to add to Love and Curry. It is very possible for Golden State to land Carmelo Anthony or even LeBron James himself if this Love trade gets done sooner rather than later. The Warriors would have to trade Iguodala to a team with cap space, which is very realistic and would not be hard to pull off. A big three of Curry, Love and either James or Anthony would be really appealing and would make Golden State an even bigger championship contender than they already are. Prediction: Golden State and Minnesota get this trade done in August or September right before training camps start. Both teams want their new players in camp to get them accustom to their new teammates before the regular season starts. Klay Thompson will be involved and end up on the Timberwolves. Boston gets Isaiah Thomas (sign&trade), Ben Mclemore, Derrick Williams?, Future 1st Round Pick? Sacramento gets Rajon Rondo, Not-Expiring-Contract player? The Rajon Rondo-to-Sacramento talks seem to have been on and off for over a year now and after the Celtics drafted point guard Marcus Smart with the No. 6 pick these talks re-emerged once again. The Celtics recently just agreed to a new 4-year, $32 million contract with guard Avery Bradley, so a future backcourt of Smart and Bradley seems like the direction the Celtics want to go. That means Rondo could be on the way out and the Kings would happily pay for a one-year rental of the point guard while they try to convince Rondo to stay long term. This would benefit both teams. The Celtics would get compensation in the form of young talent while also getting worse on the floor as they look for another lottery pick in 2015. The Kings are trying to make the playoffs and already have Rudy Gay and DeMarcus Cousins. Adding Rondo makes them a viable candidate for a playoff spot in the tough western conference. This timing of this trade could affect the movement of other free agents, as well as the movement of one of Rondo’s good friends and current Detroit Piston Josh Smith. In the link the left it says Thomas may be involved in the Pistons and Kings trade, but the Kings could probably find a way to do the Josh Smith deal without Thomas in hopes of sending him to Boston. Both of these trades happening would then affect multiple teams in free agency and the Kings projected starting lineup would include Rondo, No. 8 pick Nik Stauskus, Rudy Gay, Josh Smith and DeMarcus Cousins. A lot of situations where trades lead to trades could happen this summer, especially with the amount of above average players currently not under contract. Prediction: This trade is a lot further from happening than the first one I talked about, but I think if Rondo is going to be traded at all it will be to the Kings. 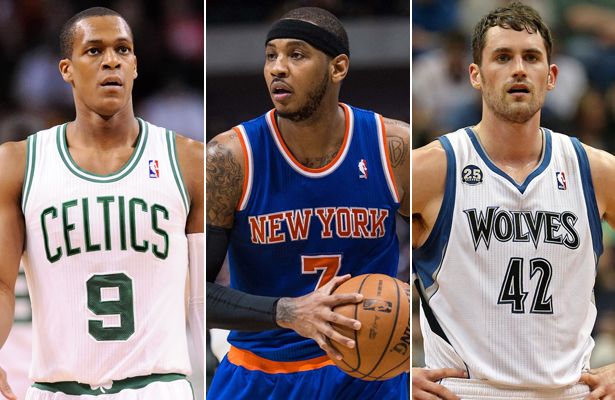 Sacramento will be the team to offer the Celtics the best package for their biggest asset. If Rondo ends up with the Kings I would then expect Smith the end up there too. I don’t think one trade (Smith or Rondo) happens without the other. This entry was posted in Draft / Offseason, Home, NBA and tagged Avery Bradley, Boogie Cousins, Boston Celtics, Cleveland Cavaliers, Detroit Pistons, Golden State Warriors, Isaiah Thomas, Josh Smith, Kevin Love, Kevin Martin, Klay Thompson, Kyrie Irving, Marcin Gortat, NBA Draft 2014, NBA Offseason, Rajon Rondo, Sacramento Kings, Washington Wizards. Bookmark the permalink.